Visit ShiftSanDiego.com or follow @ShiftSanDiego on Twitter for the most up-to-date information on construction impacts in the area. 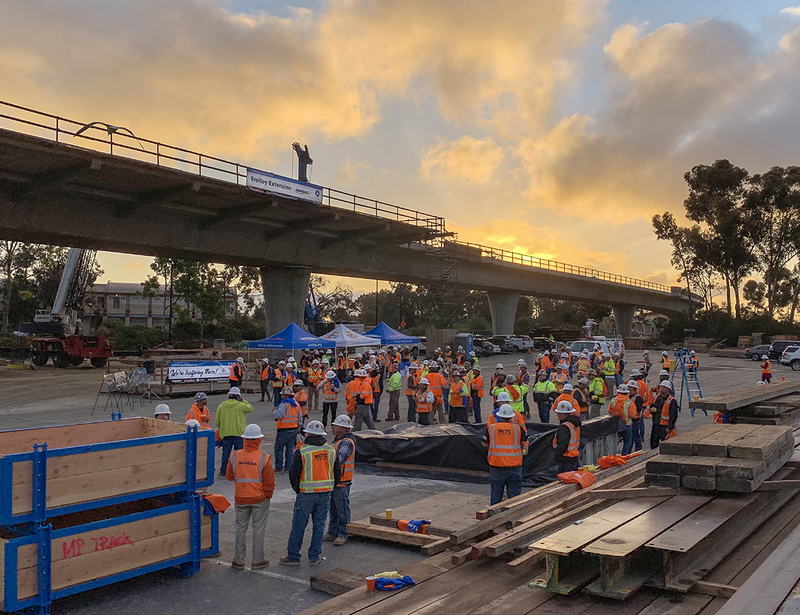 On Friday, March 29, SANDAG leadership and elected officials celebrated the Mid-Coast Trolley Project's halfway milestone by thanking construction crews for making the project possible. They showed their appreciation by serving the crews breakfast burritos and coffee at the construction staging yards that host the workers’ morning briefings. At its construction halfway point, the Mid-Coast Trolley project remains on schedule and on budget. Once complete, the $2.1 billion project will have required 4 million cubic feet of concrete, 27 million pounds of rebar, and 83 miles of railroad ties. Work for the Mid-Coast Trolley underpass at La Jolla Colony Drive. Overnight closures of La Jolla Colony Drive began in March for construction of the Trolley underpass. Lanes on La Jolla Colony Drive have been reconfigured (widened and restriped) to provide one lane in each direction for the duration of construction. Work activities will also include drilling, excavation, removal of dirt and concrete construction. Construction is expected to be completed in late 2019. For more information on this project, including a map, detours and what to expect, visit KeepSanDiegoMoving.com/MidCoastTrolley, Facebook.com/MidCoastTrolley, or @ShiftSanDiego on Twitter. 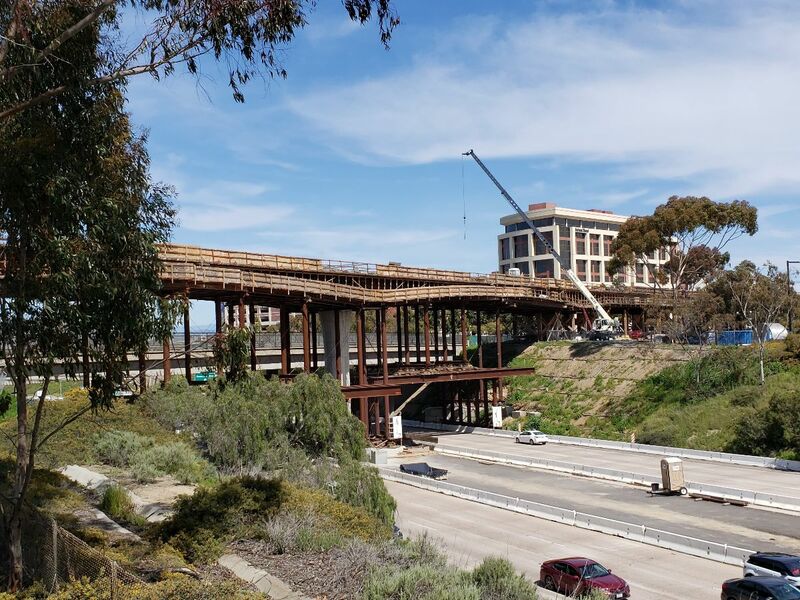 Work for the Mid-Coast Trolley girder installation at the Genesee Avenue and La Jolla Village Drive intersection is complete. This work involved setting and securing four mega-ton girders, concrete beams used to support the trolley bridge, at the intersection. The construction schedule for the girder installation at the final intersection in this area (at the UTC Transit Center) will be listed at KeepSanDiegoMoving.com/MidCoastTrolley when available. Girder installation at other locations between intersections along Genesee Avenue continues with occasional overnight and partial closures. 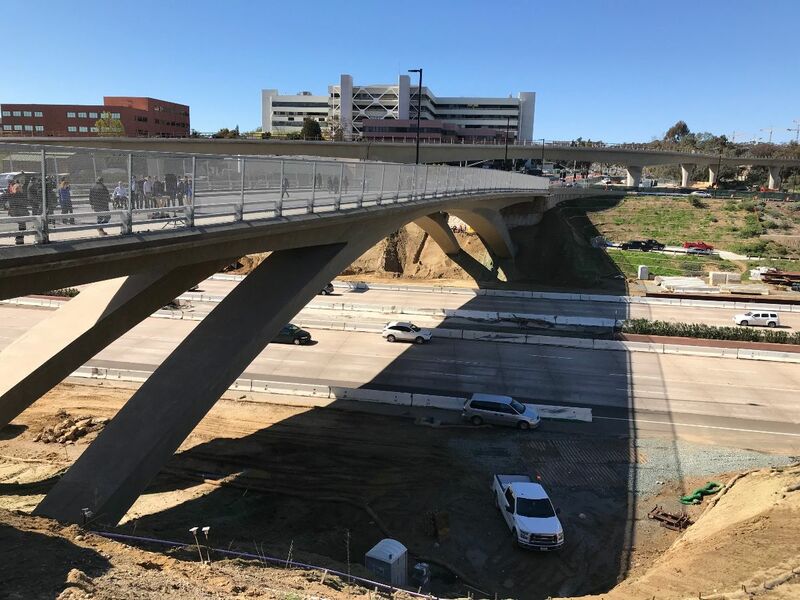 In February, crews conducted a full closure of the southbound I-5 Freeway to allow for a concrete pour of part of the Voigt Drive viaduct, the bridge that supports the trolley, across the I-5 Freeway. The next phase of work will involve pouring concrete for the deck, the surface of the bridge. Stay tuned for more updates on this section of the Mid-Coast Trolley or contact Shift for work schedules. The Mid-Coast Trolley project along Voigt Drive. 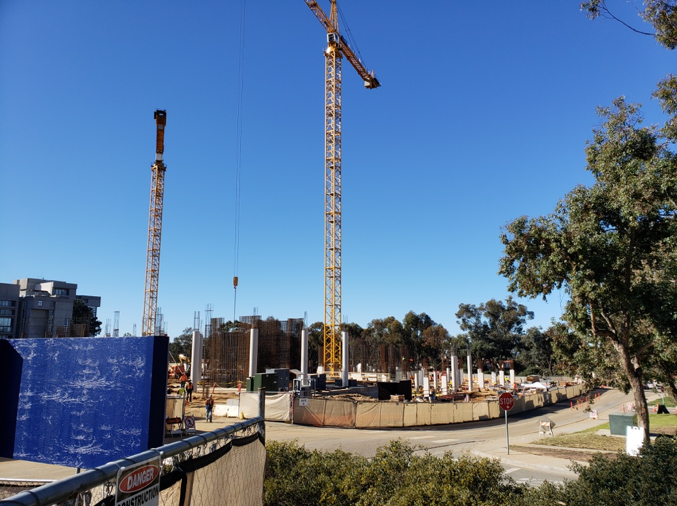 Current work for this project includes concrete foundations, walls and decks for the parking structure, and concrete columns and decks for buildings three and four, which can now be seen emerging from the project site. A tower crane at the Living and Learning Neighborhood project site. The Gilman Drive Bridge celebrated its official opening in early February. Additional striping, sidewalks and crosswalk improvements adjacent to the project site were completed as part of the Medical Center Drive South Improvement Project. The next phase of work includes earth work underneath the bridge in preparation for slope paving, installation of metal hand pipe railing off of the bridge and landscaping. The Gilman Drive Bridge during the ribbon-cutting celebration in early February. Girders, or the large support beams for the bridge, were delivered in March for the Mesa Housing side of the project. Additional girders for the project are scheduled to be delivered in April for the mid-center side. For that delivery, trucks will route from the I-5 Freeway to Gilman Drive to Campus and across the Gilman Drive Bridge. Girders being delivered to the UC San Diego Mesa Housing Pedestrian and Bike Bridge. Si desea obtener información en español, por favor comuníquese al (619) 699-1950 o pio@sandag.org. In compliance with the Americans with Disabilities Act (ADA), this document is available in alternate formats by contacting the SANDAG ADA Coordinator, the Director of Administration, at (619) 699-1900 or (619) 699 -1904 (TTY). The Shift program, formed by the San Diego Association of Governments, is designed to provide residents, businesses and commuters impacted by construction in University City and La Jolla with information and resources to minimize disruption, confusion and potential traffic challenges, as well as provide transportation solutions. For more information, visit ShiftSanDiego.com. To view other possible closures or impacts in the area, visit the construction notices section of Shift. Sign up for text alerts to receive notices for major construction and impacts by texting “ShiftSD” to 797979 and check out Shift’s commuter resources to help you get around the construction. Copyright © 2019 San Diego Association of Governments, All rights reserved.